They don't call the stretch of South First street from Gibson to Oltorf "the Mexican Mile" for nothing. 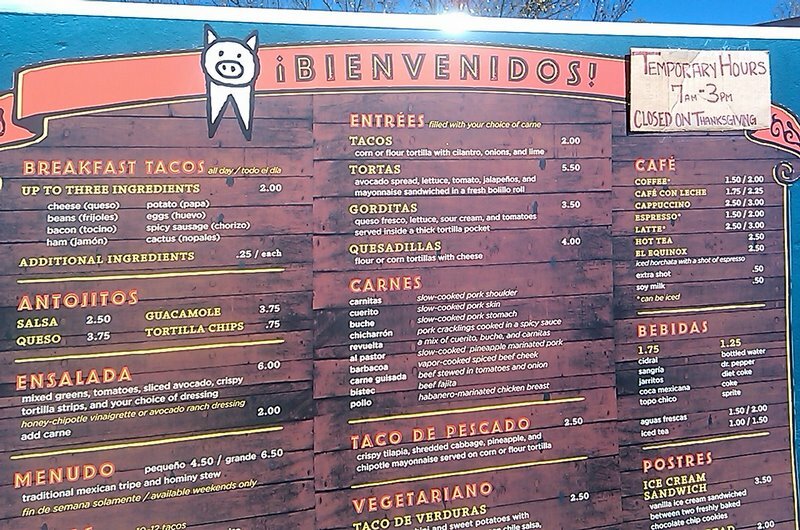 There's El Mercado, Torchy's & Izzo's trailers, Jovita's, La Mexicana Bakery, La Reyna, Polvo's, Little Mexico, and Habanero, though it's squarely on Oltorf. (Did I forget any?) 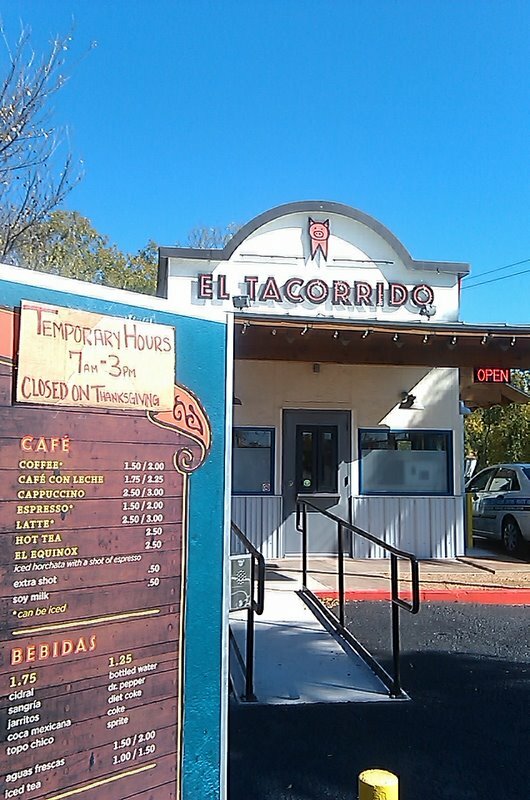 And now, adding to the list, we have El Tacorrido, which took over the former Baby Greens drive thru spot at the northwest corner of South First and Oltorf. Did we REALLY need another Tex Mex spot? 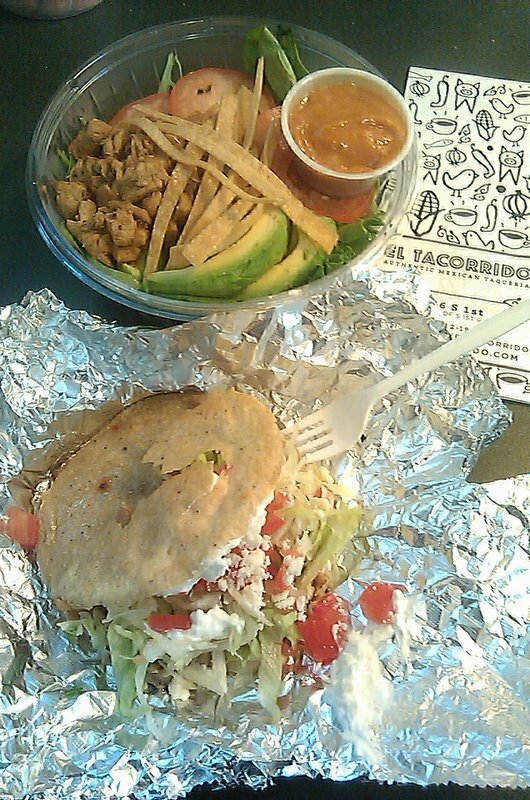 I ordered a gordita with carnitas and a salad, which I don't see listed on their online menu. The very friendly young woman who was working the window asked if I wanted any salsa with the gordita; I asked for her recommendation, and she picked the verde -- avocado, onion, cilantro, and jalapeno. Really nice and creamy, with a bit of a bite, but not overpowering. The salsa was the best part of the gordita! 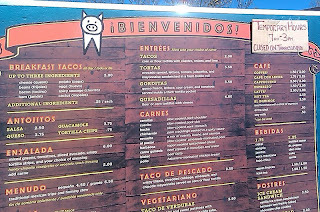 The carnitas meat was not all pulled apart/shredded. There were some chunks in there, and I hate to say it, I passed over a few of them, because they looked like they were a little past their prime, with a bit of that shimmery look to them. I sort of thought to myself "am I taking a chance here? ", but I was fine, no illnesses to report. 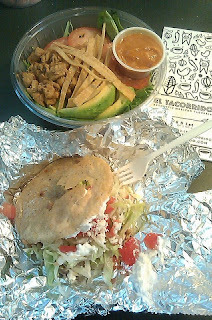 The gordita was fairly greasy, and the bottom portion of it was thick and soggy. Not the best gordita by a long shot. The salad I saved til dinnertime. For $6, you get a bowl of spinach with tomatoes and avocados, topped with tortilla strips; you can add your choice of meat for $2 more, and I opted for the habanero-marinated chicken breast. Hate to say it again, but the honey chipotle vinaigrette might have been the best thing about it. Some of the greens were past their prime, and I didn't really get any habanero heat from the chicken. For a Mexican/Tex Mex spot, I find their dessert choices to be a bit odd: ice cream sandwich (vanilla on chocolate chip cookies) or banana bread. 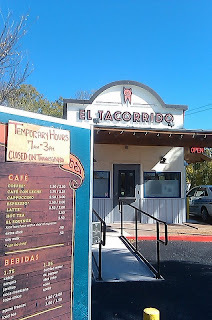 This location of El Tacorrido is the third installment around town, and it seemed like the site sat idle for months, with an "opening soon" banner on it. I have no idea who's behind these joints, and there's no additional info on their website. This was only their second day open, so I will give it a little time to shake down, and go back and try some of their al pastor and breakfast tacos. Their prices are reasonable ($2 for a breakfast taco with 3 ingredients, additional ones 25 cents each) and their hours are great (7 am - 10 pm, let's see if that lasts...). They also seem to be catering to both the traditional Mexican population as well as the gringos; there are some diverse meat options (cuerito, buche) on the board, as well as menudo on the weekends, and meat can also be bought by the pound. I just went this morning and had a bacon, nopales and egg tacos. They were delicious. I thought it was good. What you're forgetting is that this place is filling in more as a drive thru place. Which is a great addition for those of us on the go.